Twelve-year-old Henry Hewitt has been living by his wits on the streets of London, dodging his parents, who are determined to sell him as an apprentice. Searching for a way out of the city, Henry lands a position in Hampshire as an assistant to Sir Richard Blackstone, an aristocratic scientist who performs unorthodox experiments in his country manor. The manor house is comfortable, and the cook is delighted to feed Henry as much as he can eat. Sir Richard is also kind, and Henry knows he has finally found a place where he belongs. 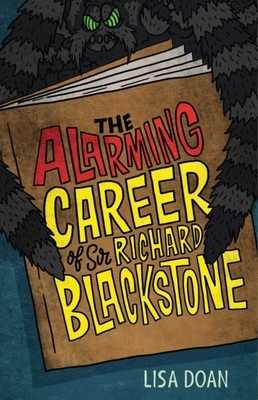 But everything changes when one of Sir Richard’s experiments accidentally transforms a normal-sized tarantula into a colossal beast that escapes and roams the neighborhood. After a man goes missing and Sir Richard is accused of witchcraft, it is left to young Henry to find an antidote for the oversized arachnid. Things are not as they seem, and in saving Sir Richard from the gallows, Henry also unravels a mystery about his own identity. Lisa Doan has an MFA in writing for children and young adults from Vermont College of Fine Arts and is the author of the award-winning series The Berenson Schemes. Operating under the idea that life is short, her occupations have included: master scuba diving instructor, New York City headhunter, owner-chef of a restaurant in the Caribbean, television show set medic, and deputy prothonotary of a county court. She currently works in social services and lives in West Chester, Pennsylvania.